We are talking to ourselves. This is increasingly abundantly clear- the conversation about the privitazation of services and demoralisation of the workforce is not reaching beyond a closed-off Twittersphere and Facebook circles. Over 250,000 people read this blog in the last two weeks, and 211,000 people have signed the e-petition to date . There are approximately 150,000 NHS doctors in this country and that, plus family members and nurses, OT and physios, minus non-social media doctors and equivalents, is probably the sum activity thus far on #weneedtotalkaboutjeremy i.e. very few card-carrying members of the public. The media coverage has been at best patchy, and at worst, disturbing. The story broke on the front page of the Independent this Saturday  and the Mirror has been covering it all along- but the lack of BBC coverage especially, deliberately not discussing the front page of the Independant on Saturdays breakfast show, highlights a disturbing relationship between the public and the media and politics. Many complaints thus far, including from this blog (see below), have so far been ignored. And in the meantime many papers continue to spew headline errors that the most basic Googling can prove wrong in under a minute. Take for example this article in the Express. * Stating over “Over half of doctors receive £75,000 pound bonuses and STILL won’t work weekends [para]”. It goes on to say 695 consultants receive bonuses of £50,000 to £75,000. There are around 38,000 NHS consultants in 2011-2012  and, far from being ‘half’, this is 1.8%. Even being generous to the Express this is deliberately misleading. And, as is obviously clear, the FOI requests show all consultants are working weekends thus far (at time of writing now 1% of all consultants). Here is a table of newspaper vs reality (all of which is Google-able in about 2-3 minutes). What is most depressing is this news article is straight from the Government, word-for-word. Is this just lazy journalism or is it propaganda? However vocal we are on social media the reality is that the ideas amongst the public form between the influence of the TV and the newspapers and by personal experience, of which there is very little on average of the NHS at an extensive level and working staff. 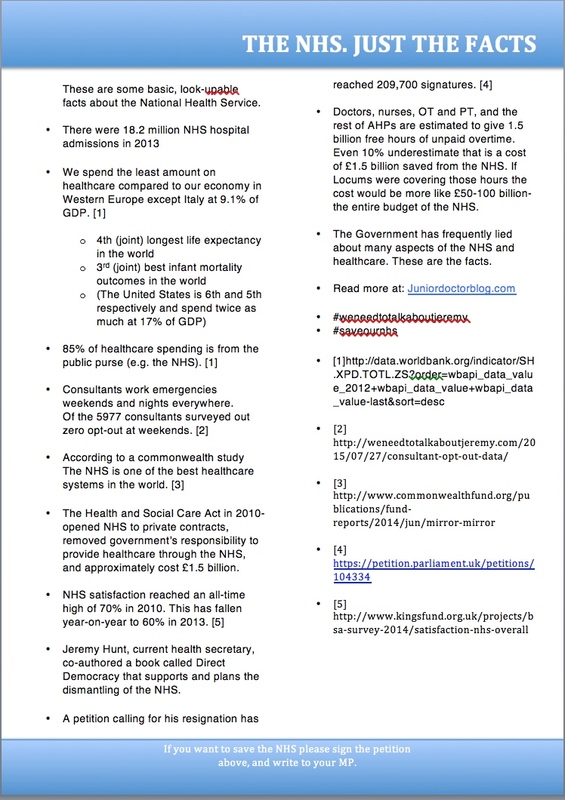 5) The NHS is actually brilliant, but there’s nothing we can do to stop it being ‘sold off’. When confronted with a few facts (a leaflet I gave them) about the system most of the public were genuinely surprised, and confused at the perception they had. But essentially, very easily persuaded to change their minds and sign the government e-petition once they were. So the public need to be properly engaged – otherwise we will shout and scream on Twitter and Facebook, but we are only talking to ourselves. 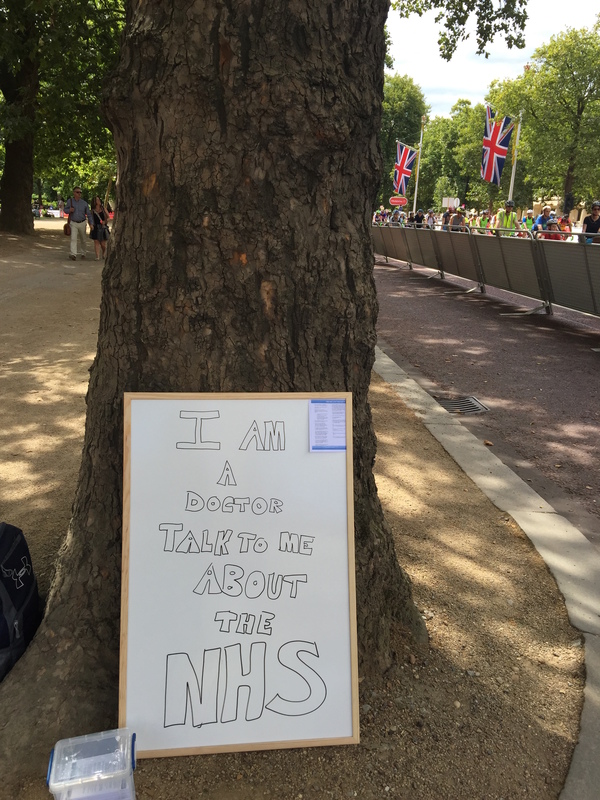 And proof-of-concept, seeing a doctor on the street is a novel and enticing means to start the conversation with those who we wouldn’t normally reach, to challenge the negative perceptions of the NHS, and rally support to defend it. With that in mind let’s go out on the street en masse and try to save the NHS, a health organisation beset by media and political illness, by engaging the public in a novel and meaningful way. So we are putting out a 2222 call. “Crash call for the NHS: The Doctors Will See You Now” is a mass protest on the 22nd August in London, venue and permits pending: a CPR marathon (on mannequins) to symbolise how we as health professionals are fighting to keep the NHS alive, despite the best efforts of a Health Secretary clearly aligned against it. We will be educating the public on basic resuscitation at the same time and hopefully replicating the opportunity for lay people to talk to doctors, nurses and other AHPs about the NHS, with just the facts, as above. But we will need help. Lots of help. So if you want to DO something about all this mess, and try to really raise the profile of this campaign, then it’s time to go to the mattresses. If you are a doctor or nurse or AHP: Sign up here to volunteer to speak with the public and leaflet. If you are a member of the public, come along, and not only learn some skills which may save a life one day but show your support for the NHS, pound-for-pound the best healthcare system in the world. Yes #weneedtotalkaboutJeremy, but if we only talk to each other, we won’t get anywhere at all. Is there a Facebook event yet? I think we have to get our unions involved too. There is a massive attack on trade unions happening now as well. Social media is not enough. We need to speak out at every meeting, every lunch break (I know- what is one of those!? ), we need to leaflet and protest. We need to be loud and lively, that is not going to happen if we are sat in our favorite chair on our computers, preaching to the converted. You need to get the facts right in your leaflet. The Health and Social Care Act was 2012, not 2010. The top down re(dis)organisation is estimated to have cost £3bn not £1.5bn. The privatisation is further along than you think – the Act didn’t introduce privatisation of clinical services, Labour did under Simon Stevens’s guiding hand in the early 2000’s. The Act created Monitor whose role is to enforce competitive tendering. Or you could try and help Dr Clive Peedell and colleagues who set up the National Health Action Party. Clive even stood in the general election against David Cameron in his Witney constituency to try and bring your attention to the disastrous dismantling of the NHS. Please join him. All across the country people form their own interest groups (save our hospitals, save our jobs) when we really need to save our NHS. And to do that you need to understand the extent of the destruction. Caroline Lucas of the Green Party tabled a Bill in Parliament in June: the NHS Bill 2015, created by Prof Allyson Pollock and only tabled because of an immense amount of work by campaigners. This situation needs a political and legislative response. Youssef el Ginghy has also written a short book: how to dismantle the NHS in 10 easy stages which is a good introduction into just how far down the road we are. You must get the facts right on your leaflet. The Health and Social Care Act was 2012, not 2010. It did not start privatisation. Labour did in the early 2000’s under Simon Stevens’ guidance (oh yes, he has been here before). The 2012 Act created Monitor, who ensures competitive tender of all contracts now. The top down re(dis)organisation cost an estimated £3bn, not £1.5bn and is dwarfed into insignificance by the cost of running the commissioning system and the market (in place since the 1990’s) now estimated as costing at least £4.5bn a year and possibly as much as £10bn. Welcome to the fight though. It’s sad so many staff haven’t woken up to the urgent need for action until J Hunt attacked you personally. It’s great that you are in it now. It would be really supportive and very effective if you would join en masse to one of the national campaign groups that has been trying so hard to get your attention for years like Keep Our NHS Public. Or with people who are prepared to walk 300 miles across the country to try and raise awareness, like 999Call for the NHS (yes, young mums and pensioners walking 300 miles, recreating the Jarrow March only for the NHS). Please join up with Dr Clive Peedell. He stood for his party, the National Health Action Party, against David Cameron in his Witney constituency in the general election, ran miles carrying a coffin of the NHS to symbolically ‘bury’ when the Act was created, has been in the news, the radio and on TV telling the truth, trying to get the message across that the damage and destruction being wrought is extreme – and based on lies. You joining en masse would create a powerful political statement. Caroline Lucas tabled Prof Allyson Pollock’s NHS Bill 2015 in June this year. It took a lot of campaigners a lot of hard work to get it there. The NHS needs legislation now to restore it. You can watch the documentary Sell-Off the abolition of our NHS on YouTube to understand it all. Or read Dr Youssef el-Ginghy’s book How to Privatise the NHS in 10 easy steps. By the way the day that’s been chosen for action, the 22nd August, is also the day that 38 degrees is organising their mass action on TTIP awareness. The TTIP must be opposed as it threatens all our public services. Good campaigners try not to conflict with others’ major events unless they can work in tandem with them (you can, of course…). Please don’t start a separate campaign. The fragmentation of the fight for the NHS is caused by each new group deciding they need to do it their way, instead of joining to create an unstoppable force with those who have already done all the ground work. Please be the glue, not another fragment.